The results of the research, conducted with the collaboration of the Josep Palau Francàs Foundation, are consistent with the fact that drusenoid deposits are located just above the retina photoreceptor layer. Dark adaptation time is defined as the time necessary after being exposed to bright light to recover sensitivity up to a certain intensity of stimulus, defined in this study as 5×10-3 cd/ m2. This is related to the time necessary for the regeneration of rod pigments, photoreceptors responsible for vision in low lighting. The study differentiated between patients with soft drusen and patients with an ocular fundus formed predominantly by reticular drusen, due to the different location of these drusen types in the retinal layers. The research concluded that the patients with drusen show a poorer adaptation capacity than the control group (no visual problems and with normal ocular fundus). This deterioration is accentuated in the reticular drusen subgroup, which is consistent with their perifoveal location and which coincides with the zone with a high rod density. The Barcelona Macula Foundation: Research for Vision (BMF), in collaboration with the Josep Palau Francàs Foundation, conducted the study DARK: Deterioration of the dark adaptation function in patients with drusen. The research was performed by BMF’s collaborator and the coordinator of clinical trials of the Institut de la Màcula, Míriam Garcia, an optometrist who holds a Master’s Degree in Clinical Research. It was led by the BMF’s Medical Director, Dr. Jordi Monés, and the co-researcher, Dr. Marc Biarnés, a clinical epidemiologist and researcher. It also boasted the collaboration of Dr. Anna Sala Puigdollers, the retinologist at the Institut de la Màcula. The research took into consideration that some studies postulate that the presence of drusenoid deposits can impede proper transportation of molecules between photoreceptors and the retinal pigment epithelium. This leads to a more limited adaptation to low-light conditions. 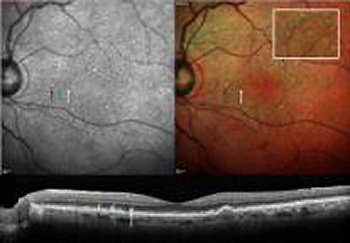 It considers the evidence that reticular drusen are strong predictors of the progression both of neurovascular Age-Related Macular Degeneration (AMD) and of geographic atrophy (GA), which is one of the most advanced stages of AMD. This position suggests that it is important to interpret the role played by this type of drusen in the pathogenesis of AMD. In previous research conducted by the University of Alabama, the dark adaptation function was quantified by comparing different ages and stages of AMD. It concluded that this function worsens with age and as the pathology progresses. The DARK study compared the percentage of patients with soft or reticular drusen that suffer alterations in the dark adaptation function in comparison with a healthy retina control group. It also calculated the differences in dark adaptation time between subjects with soft and reticular drusen. The average dark adaptation time, Rod Intercept Time (RIT), was established and compared for each subgroup using the AdapDX (Maculogix®) instrument. Selected for the case group were patients of over 50 years old and who had a predominance of soft or reticular drusen associated with the early stages of AMD in one eye but no other pathologies. For the control group, subjects without an ocular pathology were selected. Two independent observers classified the subjects, from images of the ocular fundus and optical coherence tomography, according to whether they presented soft drusen, reticular drusen or neither of the two pathologies. The RIT of all the patients was analysed, with the time for recovery to a visual sensitivity of 5 x 10-3 scot cd/m2 considered as the principal variable. An RIT exceeding 12 minutes was deemed abnormal and, if the dark adaptation time could not determined after 20 minutes, the patient was considered to have an RIT of 20. The comparison of the average RIT between the groups (the Mann-Whitney test) was considered as the principal variable, while secondary results included comparison of the percentage of abnormal RIT between groups (Fisher’s exact test), comparison of average RIT between the patient subgroups with soft drusen and reticular drusen (the Mann-Whitney test) and a multivariate linear regression model to evaluate the independent contribution of baseline characteristics in RIT. The study included 20 eyes of 20 patients, 12 with drusen (8 with soft drusen; 4 with reticular drusen) and 8 control eyes. The groups were similar in all the baseline characteristics measured (age, gender, best corrected visual acuity — BCVA —, blood pressure, diabetes, smoking habits, family history of AMD; p≥0.08). The patients with drusen showed a higher RIT compared to the control patients (20 vs 6.46 minutes, p=0.001), while no statistically significant difference between the patients with soft drusen and the patients with reticular drusen was appreciated (18.7 vs 20, p=0,11), although all the patients with reticular drusen showed an RIT in excess of 20 minutes. The presence of drusen and age (p≤0,047) was associated with higher RIT rates after adjusting for the gender and BCVA variants. The study concluded that the patients with drusen have a higher RIT and therefore dark adaptation is worse than in the control patients. In this sample, over 90% of patients with drusen showed an abnormal RIT. The fact that it was impossible to determine the RIT in any patient with reticular drusen —as we said, they all exceeded 20 minutes- is attributed to their very poor dark adaptation capacity. Drusen are small accumulations of extracellular material deposited in the retina, specifically between the retinal pigment epithelium (RPE) and Bruch’s membrane, in the case of soft drusen and between the RPE and the photoreceptor layer in the case of reticular drusen. The presence of some drusen is habitual in people of over 40 and is considered to be normal. However, the multiplication of these deposits in the macula is one of the early symptoms of AMD.